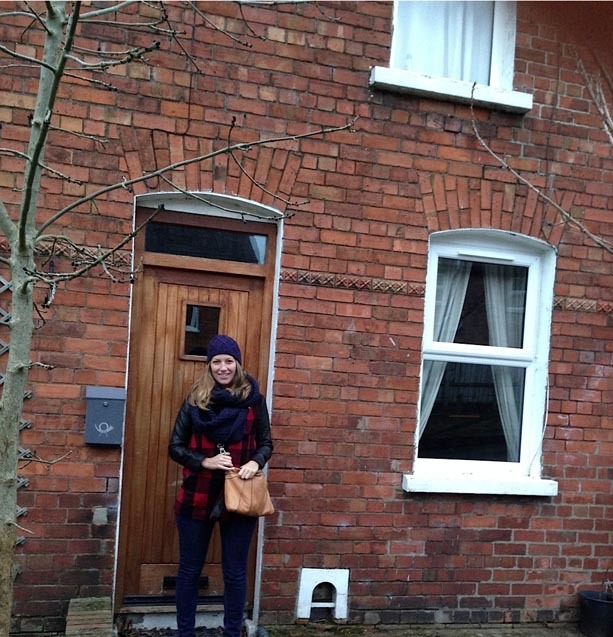 On February 9th, in a driving snowstorm, I left for Northern Ireland. My daughter Charlotte, who had been traveling abroad for 6 months across Europe and Asia, invited me to come there to see her and meet a young man she had met at surfing camp in Portugal some months before. Charlotte in front of millworkers’ cottage. 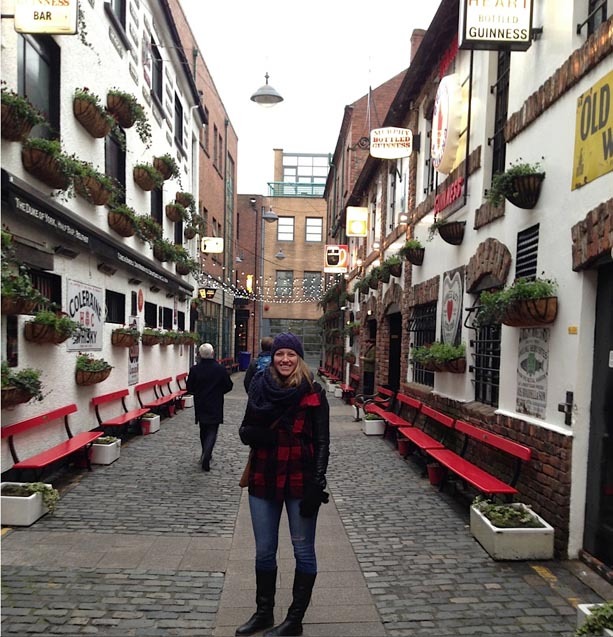 When I finally arrived in Belfast after the inevitable airline delays, I was thrilled to see my daughter looking so beautiful and happy. 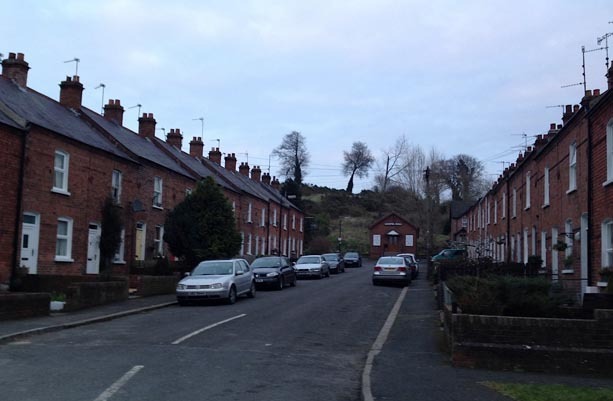 We decamped to her friend Michael’s tiny rental house that sat at the end of a row of attached brick millworkers’ cottages in an area called Minnowburn, in the 4,000-acre Lagan Valley Regional Park on the outskirts of Belfast. Every morning we’d eat breakfast and then head out onto the grounds of this verdant place. 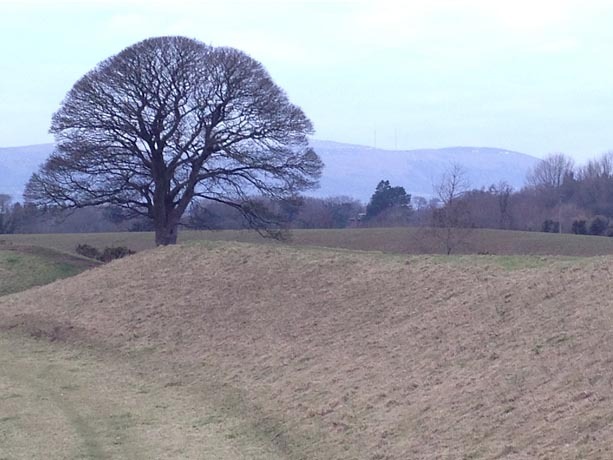 Woodland meets farmland; canals turn into streams; hills become Neolithic earthwork circles before your very eyes. I couldn’t get enough of it! Aerial view of the Giant’s Ring. Image courtesy of Telegraph UK. 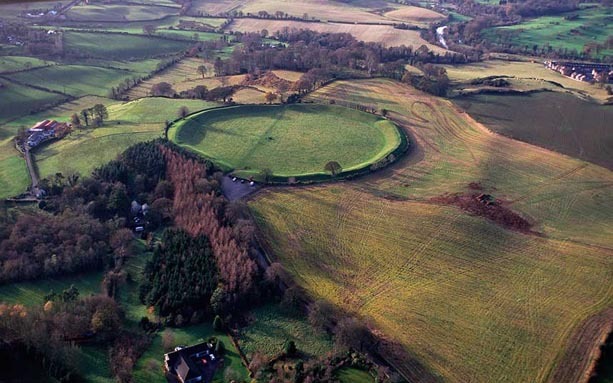 Just 10 minutes up the hill was the Giant’s Ring—a massive earthwork circle that measures 200m across and was built around 2,700 BC. 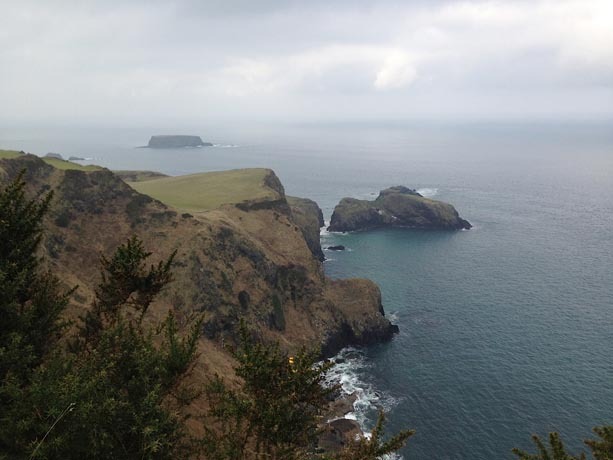 It is conjectured that the Ring was not built for defense but may have been used as a ceremonial gathering place as well as for burials. Aerial photos show three more rings between the interior ditch and the center. 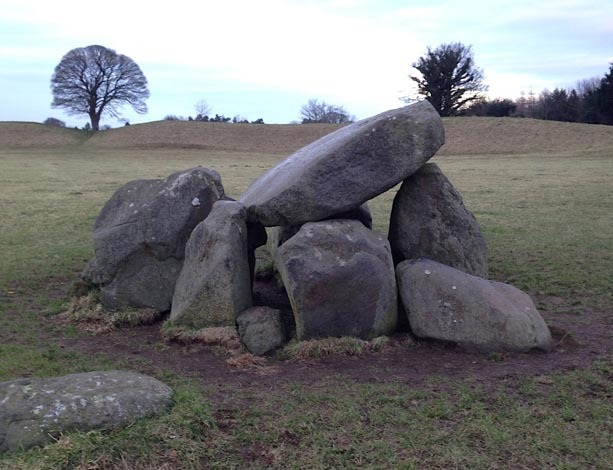 At its interior lie 5 upright stones and a large capstone that covers what may have originally have been a passage tomb. An impressive number of workers would be needed to build such a mound, along with the engineering skills to set the stones and place the wooden posts that may have been arrayed around the rings. Upright stones and capstone at the center of the Giant’s Ring. 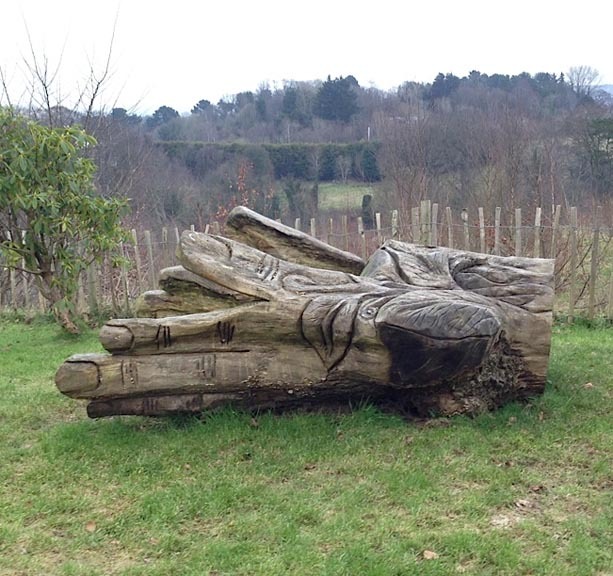 The Park also includes chainsaw art arrayed along its miles of paths. 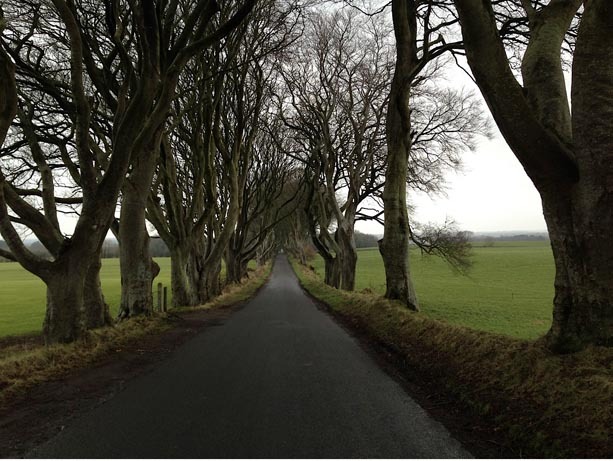 Over the weekend, Michael, Charlotte and I took a drive to the North Coast and enjoyed visiting the Dark Hedges (made famous in Game of Thrones)—an allee of ancient beech trees along a narrow lane on your way to the coastline. 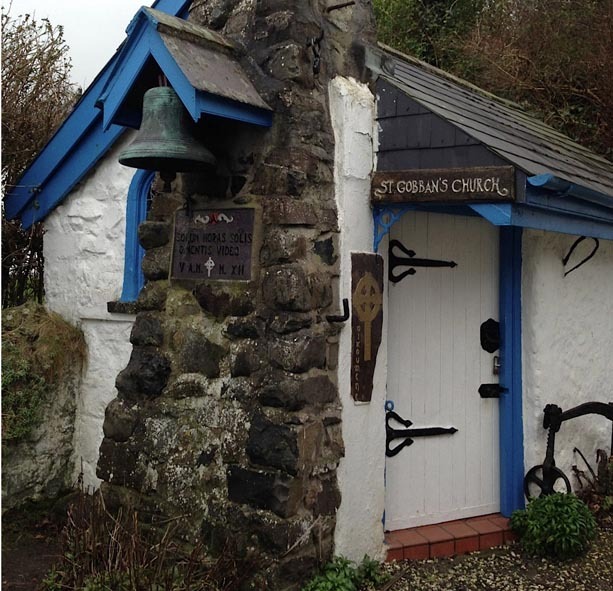 Then, we visited the tiny 4’ x 10’ St. Gobban, the smallest church in Ireland, located on majestic White Park Bay. We spent the night at the charming Riverside Bed and Breakfast in Cushendall and enjoyed Pat and Ann, the innkeepers, their marvelous breakfast, spotless and comfortable rooms, the delicious fish restaurant (Upstairs at Joe’s) and pub (Jonny Joe’s) across the street. It was a treat to sit amongst the five accordion players, a tin whistler, and guitarist, all my age or older, and enjoy a pint or two before retiring for the night. 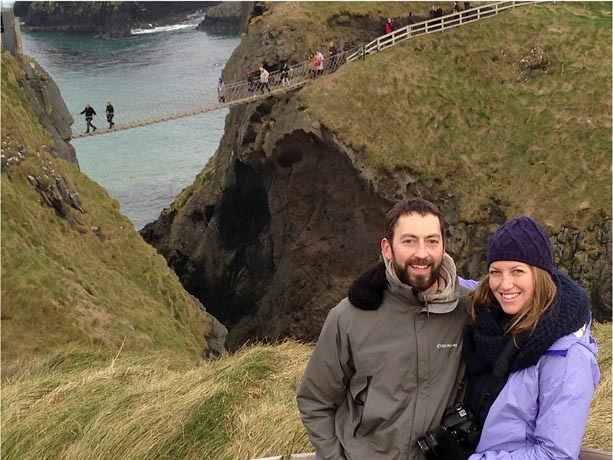 The next day we became tourists and went to the Swinging Bridge in Carrick-a-Rede and the Giant’s Causeway in Bushmills (known also for its Irish Whiskey). I’m not a fan of swinging bridges, especially when perched over a chasm with roiling ocean below. The Giant’s Causeway is a UNESCO World Heritage Site created from millions of years of volcanic eruptions, cooling, and erosion. 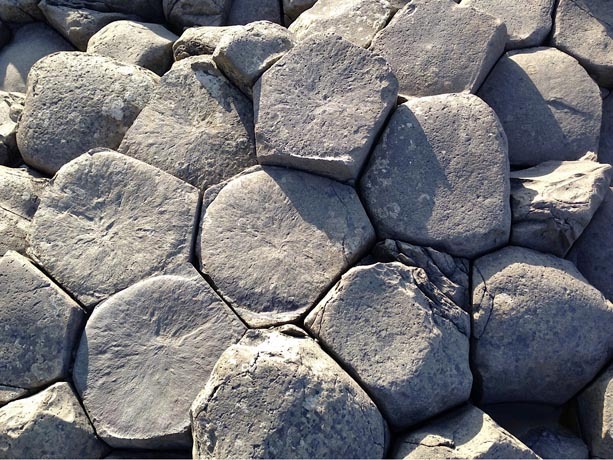 Over time, this caused the formation of over 40,000 interlocking basalt columns, many in a hexagonal shape. 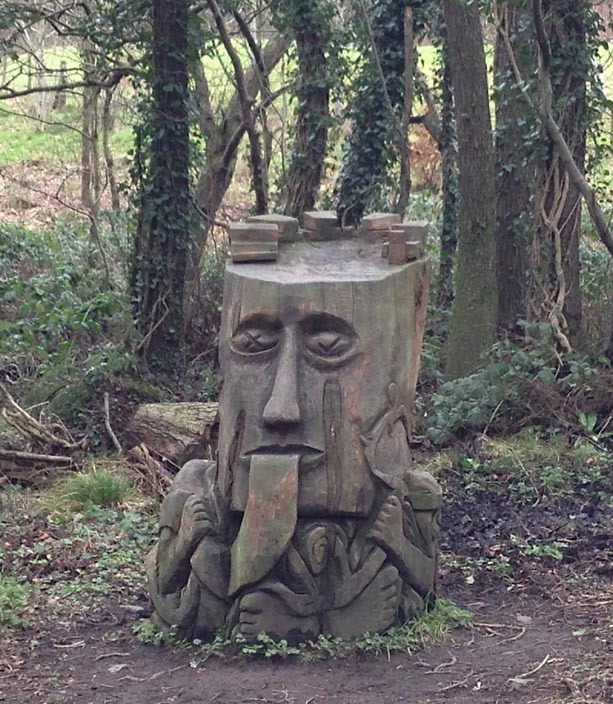 Local legend says that giant Finn McCool carved out the columns, and left magical remnants such as the Giant’s Boot, the Wishing Chair, the Camel, the Giant’s Granny, and the Organ, all of which you can see in walking tours of the Causeway. And then back to Belfast. You can read more about Charlotte’s adventures and see her beautiful photography on her wonderful blog, Stories from a Solo Traveler Around the Globe. This is a lovely travelogue. 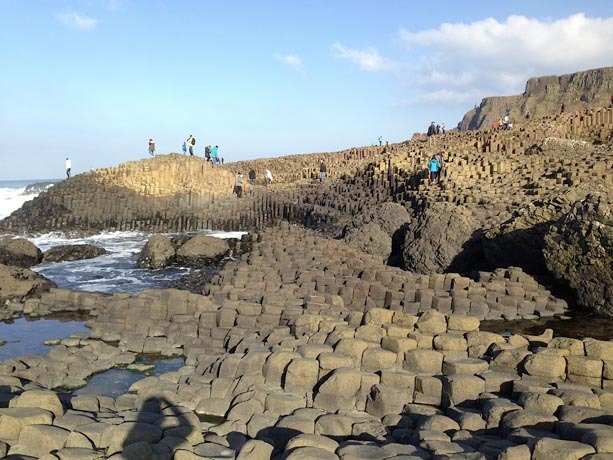 Photos of these magical spots (hexagonal rocks!) capture so well how the place feels, an inspiration to put planning for my upcoming Canal du midi trip on the front burner.